Oh Office. You will never fail to disappoint me when it comes to designing abominations alongside absolute beauties! Take these sandal boots. 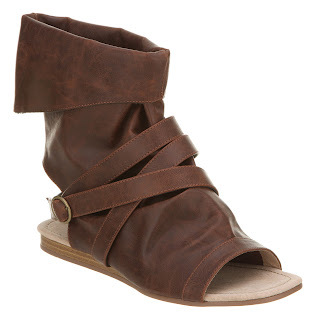 Now consider the concept of a sandal and a boot combined into one handy to wear item. Now look at them again and confirm your darkest fears. I don't get it. They're not weather appropriate in any way which would be one argument for them. Nor can I see them styled with anything. The only person I can see wearing them is a Geldof Girl and quite frankly, they should hardly be held up as any kind of aspirational icon. And I can't decide if they're overpriced at £40 or fairly reasonable in Office terms. One thing I'm definitely sure about is that they exude a distinct aroma of Fug Du Jour.